I bought a Dot last week-end in London and had no problem setting it up back in France. I've downloaded the Amazon Alexa APK and installed it on my smarphone, using my UK Amazon account. My echo dot won't find my French address. I'd like weather and traffic updates. Has anyone any idea how I can rectify this? Hi Tia, I was able to change my address to my French address. Log into your account (I've got an Amazon.co.uk account). You can also change your time zone here. I live in France and I've set up my Echo on a US account so far. Can you see France in your list ?! I am another potential user living in SW France. I am about to buy an Echo Dot via my UK Amazon account and have it shipped to a friend for onward postage here. I will post again (or beg for help) once it arrives. I bought an Echo Dot in the UK and am now I'm working in SE Asia. I have the same problem here. I can change my time zone, but the Echo will not accept the fact that I'm in the Philippines. All local stuff I ask Alexa is still based on the original location. Very disappointing. Why can't Amazon understand that people don't stay in one place all the time. I know you're in the Philippines because you are very specific where you are. Of course I will know coz I was born there. I have an amazon.co.uk account and I can access alexa on laptop. It will not let me download the Alexa APK app though saying I am not eligible as not in the UK. Even with a vpn putting me in the UK. Any tips please ? what is the next best app I could use. Otherwise I will be sending it back to QVC as there are so many limits being in France. I have the same issue for Italy. 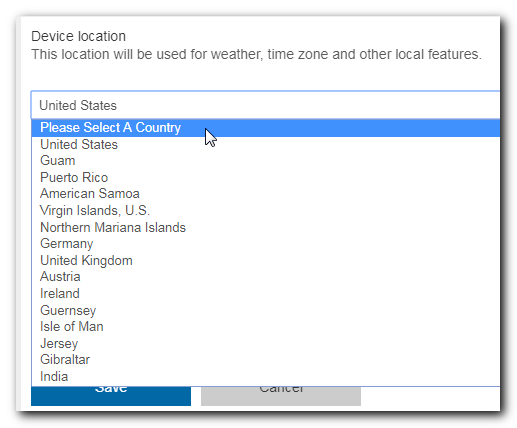 It is not on the list of countries to select in order to change the location of the device. Out of all the European countries it seems that only France and Italy are missing... ?? On my Amazon.com account setting, when I chose my Alexa device I have no option to change it settings (no such option as General, device location and so on). Is there a way to contact Amazon and ask for clues? Greetings from Alexa Customer Support! I understand your concern regarding the availability of Alexa in France and Italy. I apologize for the inconvenience caused to you. Please be informed that at the earlier stage it was only available in the U.S. But we are expanding its marketplace and currently it is also available and being used in United Kingdom, Austria, India and Germany. Please be informed that, this project is still in development stage and our developers are working very hard to make it available worldwide so that our customers from all over the world can take advantage of Alexa. I don’t think that the answer is fully correct given that the list of locations includes many other countries besides the ones mentioned in the reply. If all affected customers write, perhaps we may push for a quick update. Echo products are not sold in France and Italy therefore there is no need to contact Amazon for support ! If you are impatient then stop being : they will release their products when they are ready.